The vivo NEX 2 will likely have 10GB of RAM and a Snapdragon 845 chipset. 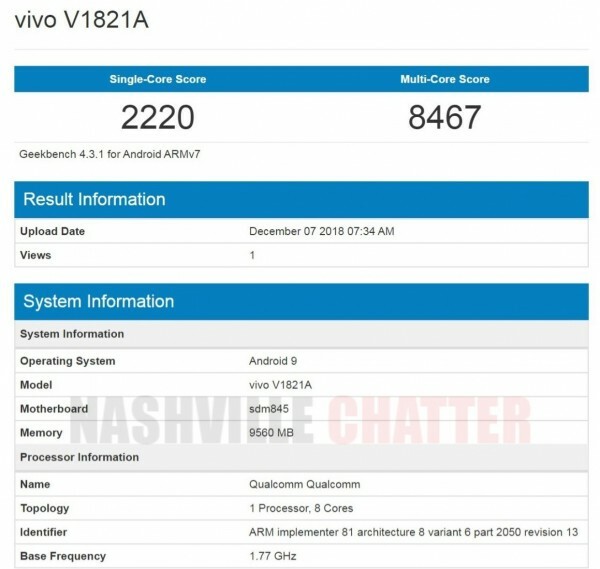 The information is confirmed by a Geekbench listing of a vivo V1821A device with the aforementioned credentials. Interestingly the vivo in question is also running Android 9 Pie, which would make it the first vivo smartphone on Android's latest software. According to a related leak, the main camera on the back of the vivo NEX 2 (one of three) will have an ultra fast f/1.3 aperture - claiming the spot of the smartphone with the widest aperture around. As for the screens, rumor has it the main screen will be a 6.59-inch panel with screen sound casting tech (meaning you'll hear calls through the screen itself, like on the first-gen vivo NEX) while the second display will be a 5.5-incher that will work independently. We know how vivo intends to switch between screens - with a three-finger gesture. So crazy, this setup would require ISO 2048000 to match the amount of light gathered by a 12MP camera (1/3.6" sensor, 1.12um pixels, OIS, f/1.8 lens) at ISO 50.